Well, after a long while, I have finally reached a size I am semi satisfied with. 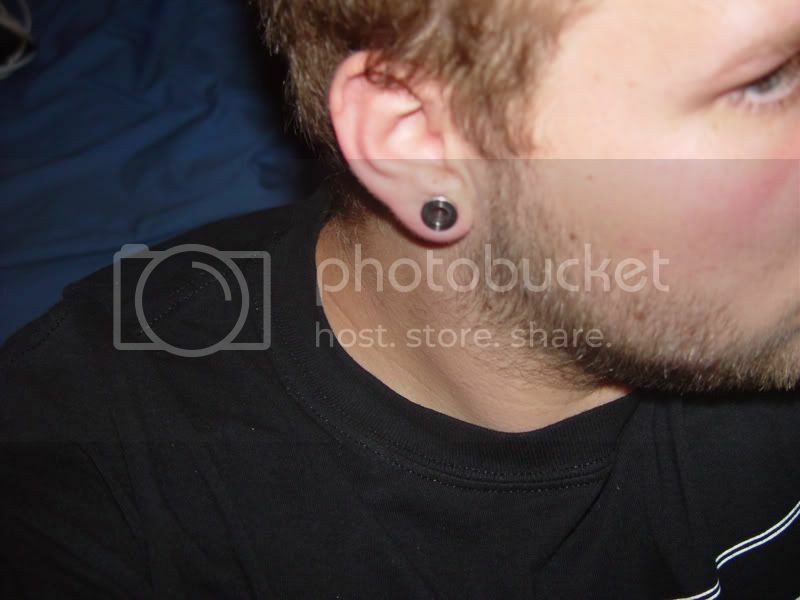 After doing it without the parents consent, I put a 0 gauge in my ear. I was supposed to stop at a 4, but then went to a 2, now I am at a 0. My dad saw and got mad, blahhh, but then finally let me keep them. I am semi satisfied with them. As soon as I turn 18, I will be going up. 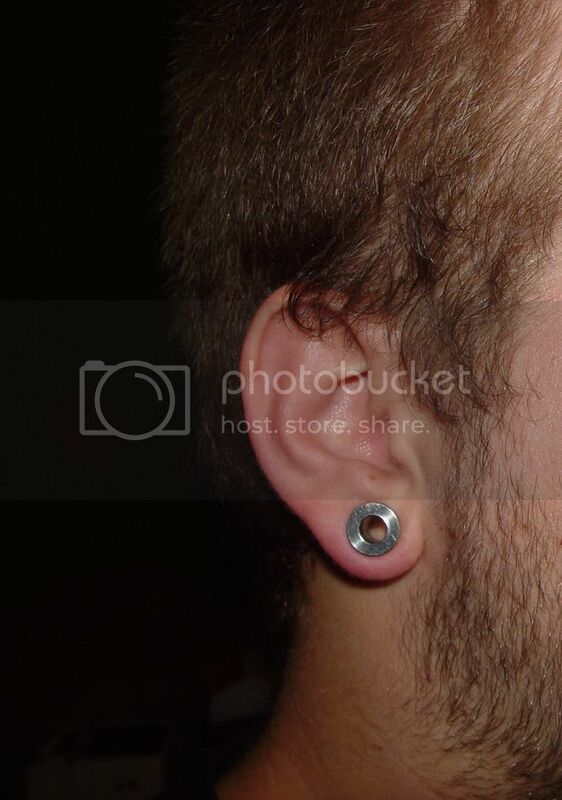 I will be ATLEAST to a 1/2'' when I am 18. Now for pics. White boy syndrom... (too much facial hair... sux to have to shave every day). Well i guess you know that it will never grow back... I think you should stick with the 0... becasue 1/2 is too big IMO. Yeah looks cool... But I would not go any bigger either. Maybe get a few new ones. but i guess if your happy its fine. Lol, when my dad was giving me a lecture he said, "when you're 18 you can stretch them to whatever then snip them and they'll be funnel cakes.!" Haha, I hate shaving alot. I was thinking about sticking with the 0, but I have this thing about not being satisfied with the way it looks and feels and stuff. So I will probably go until I'm satisfied with it. Lol, no thanks, I only want one hole per ear. . I will most likely be getting snake bites at 18 also. There are jobs around here that I could work at, mainly stores like hot topic, zumies, and local stores around here. 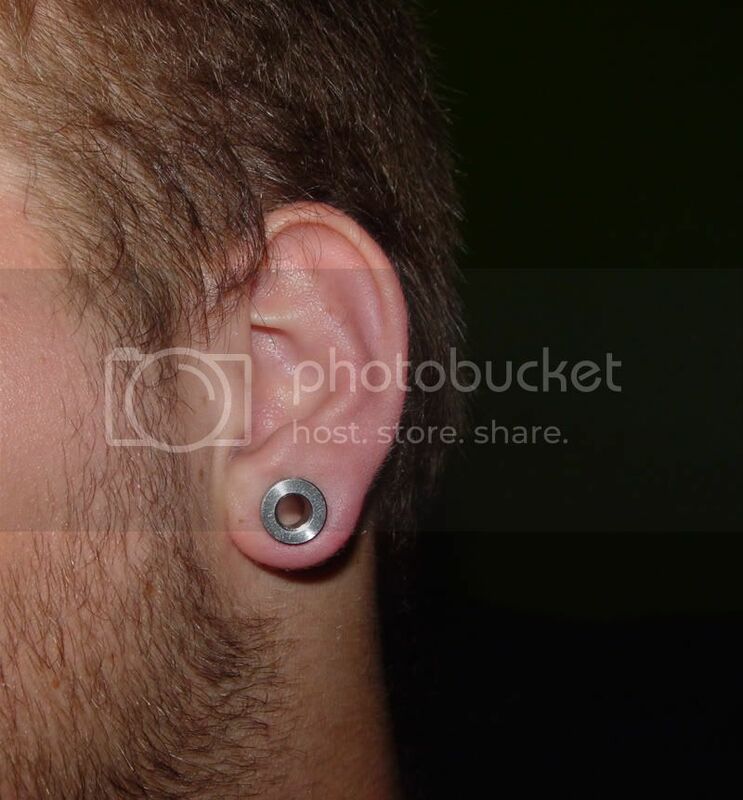 Also, I see alot of people working at resteraunts and movie theaters with their ears gauged bigger than mine. when i played hocky, a kid on my team had gauges. we had this team party thing at golden corral, and he put i straw through it and had someone drink from it. it was great. haha, I could put a straw through mine when I was at a 2, so I still can. I'm going to link a bunch of straws together and put them through my ear and to my mouth.